Provide you a charming look, becoming more fascinating. Size: necklace: about 43 cm, style is send by random. Material: sterling silver. AAA Brilliant cut pave simulated diamond hoop earrings. size- 14mm- pave design-immaculate sparkle and as in real diamonds. 18k white gold filled. Gold filled /not solid gold. These earrings are top of the range, there is no comparison to the cheaper versions. Size- 7mm stones- The stones are of high quality, they sparkle and have blue hues just like real diamonds, ( look in the pictures above). Gold filled /not solid gold. These earrings are top of the range, there is no comparison to the cheaper versions. Ladies Tacori simulated diamonds set in hall marked silver cluster ring. 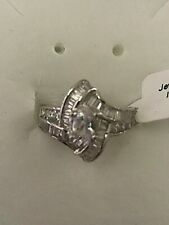 Tacori simulated diamonds set in hall marked silver cluster ring.Size Ladies Y/Z extra large 22.5 mm. 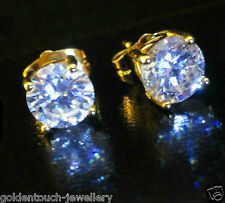 Beautiful White Gold Filled Simulated Diamond (Cubit Zirconia) Heart Crystal Stud Earrings. 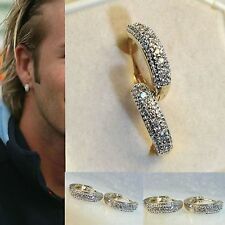 AAA Brilliant cut pave simulated diamond hoop earrings. size- 13 -15 mm- pave design-immaculate sparkle and as in real diamonds. These earrings are top of the range, there is no comparison to the cheaper versions. 18ct Gold plate finish. Lobster clasp fastening. Stunning simulated Pearl and sparkling simulated diamond gemstone. ONE set only; multiple pieces are shown in the included pictures purely for illustration purposes! BRIGHT SILVER COLOURED NECKLACE WITH SIMULATED DIAMONDS. CHAIN LENGTH IS 35cm. Very flashy and ornate diamond effect heavy and opulent necklace with matching elasticated bracelet, and choice of two styles of clip on earrings. Necklace and earrings in great order, one stone missing from the bracelet.see photos for exact condition. 18 CT white GOLD PLATED lion PENDANT CHAİN. Chain: 30" / 76cm. Hip Hop Style. Brilliant cut pave simulated diamond stud earrings. size- 10mm- pave design-immaculate sparkle and blue hues as in real diamonds. Gold filled /not solid gold. 18kt white gold filled. These earrings are top of the range, there is no comparison to the cheaper versions. Can be worn as one or two together. Gift bag included-Pefect gift Display box not included. Main Gem Size:6mm. This a sterling silver necklace with a white glass pendant with wrap around silver plated filligree. White diamond is the birthstone colour for April. Large eye catching ring platinum plated & simulated diamond Size L1/2. All stones are flawless and high quality polished. With their fire and Sparking like REAL DIAMOND. Treble Clef. New, High Quality Lapel Pin. Great against a dark piece of clothing for a wedding, party or daily wearing. Bri desmaid Prom Dangling use Swarovki Crystal White Gold Plated Earrings E028. Colour: Clear crystal with 18K WHITE GOLD filled. 100% REAL SWAROVSKI CRYSTAL USED. This beautiful pair of earrings using swarovski crystal with coating gives it an eye-catching sparkle like REAL NATURAL DIAMOND. Beautiful Aquamarine And Diamond Vintage Look Ring Size N.